In today’s digital world, enterprises must establish a secure reputation online and provide an immediate sense of confidence about their businesses to those examining them. 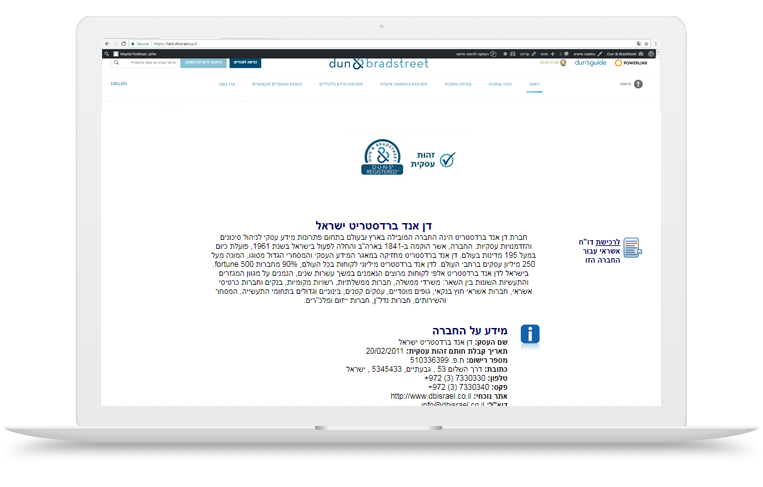 Dun & Bradstreet’s D-U-N-S Registered Solutions allows potential local and international clients to view your business Identity Card and differentiate it from the competition. The Seal indicates that your business details appear in Dun & Bradstreet’s international databases, assuring that it is reliable and professional and providing customers with all the information they need to conduct business with you without reservations. Interested in D&B D-U-N-S Registered Solutions ?